There's something so alluring about an all-white palette, whether in the dining room or the bathroom. The only (potential) problem? It can run of the risk of reading boring or stark. But with the right tools, you can create a retreat that effortlessly bridges the gap between overly pristine and inviting. Need inspo? 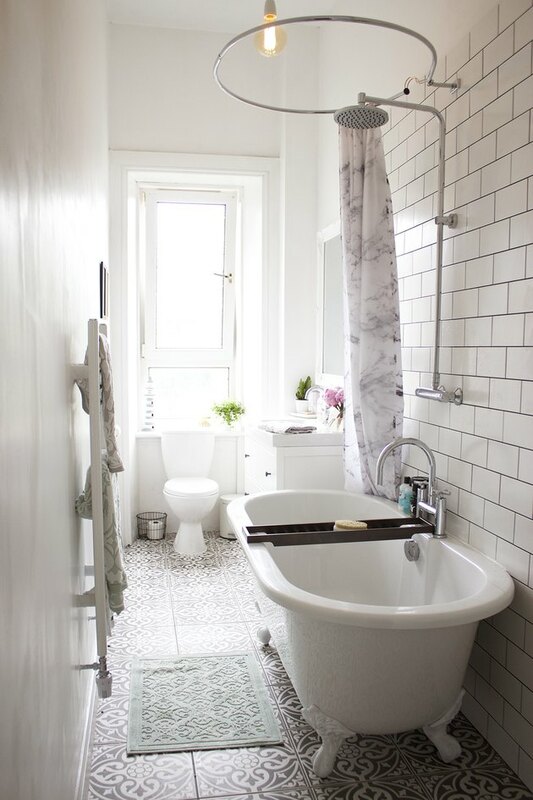 Take a peek at these 12 beguiling white bathroom ideas. 1. Bring in a bit of whimsy. An all-white space is literally a blank canvas. 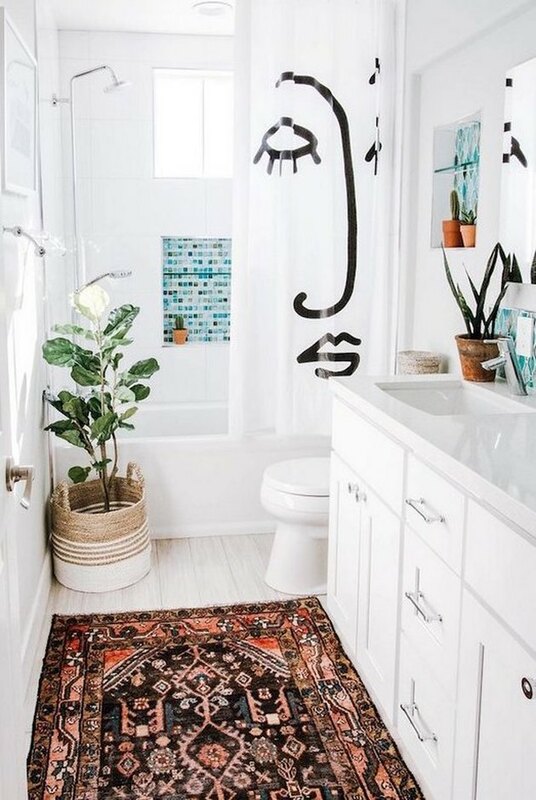 Inject personality like Anita Yokota did in this bathroom with whimsical accents such as a hand-drawn face shower curtain, an area rug, and verdant plants. 2. 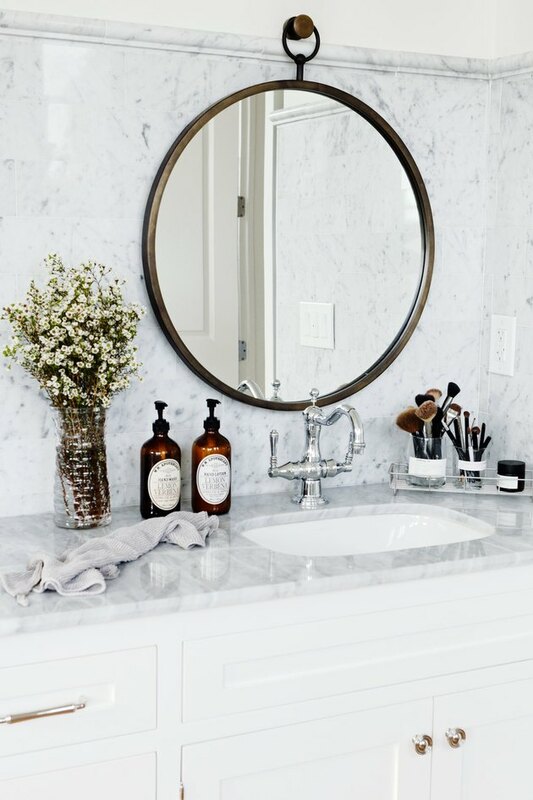 You can't go wrong with marble. Marble is sleek, sophisticated, and super luxurious. And it doesn't hurt that this natural wonder has so much depth and dimension. If you have the funds, go wild on the walls and the countertop like Hannah Phillips-Kaplan, the founder of Repeat+World, did in her white bathroom. 3. Consider a clawfoot tub. 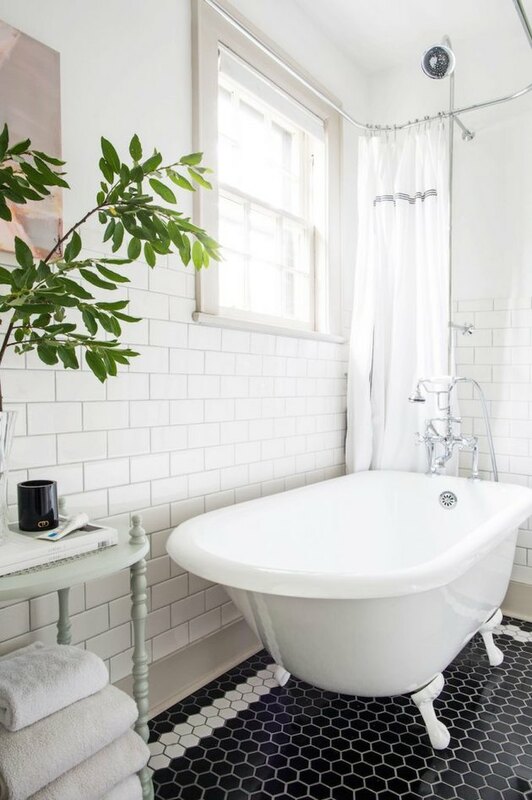 With its ceramic tile and thoughtful decor, this bathroom belonging to Kate Spiers of Kat La Vie strikes the balance between contemporary comfort and vintage romance. Of course, the gorgeous clawfoot bathtub is the star. Black and white mosaic floor tile and on-trend brass cabinet hardware provide eye-popping contrast to the snowy scheme in this sparsely adorned oasis belonging to Erin from Sunny Circle Studio. It's quite striking. Don't ya think? 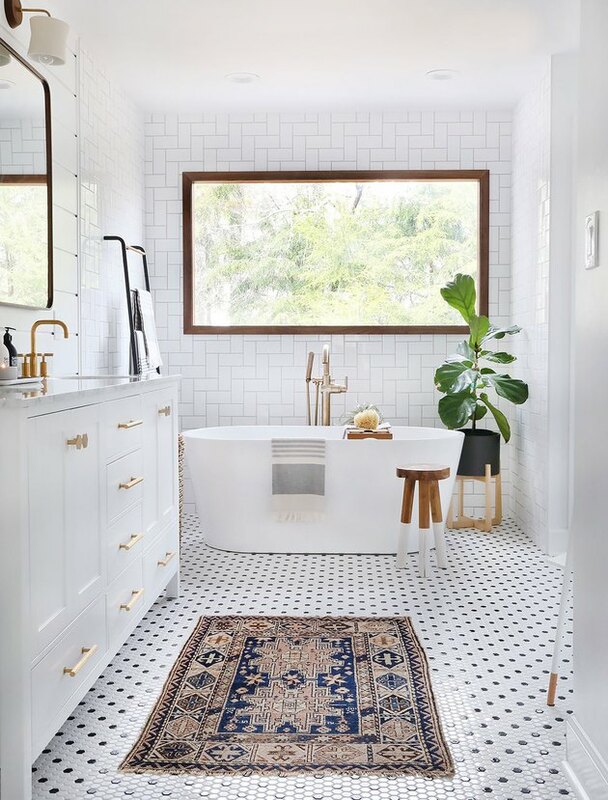 If your bathroom is small, investing in a bold floor tile is a great way to break up the monotony without overpowering the rest of the space. 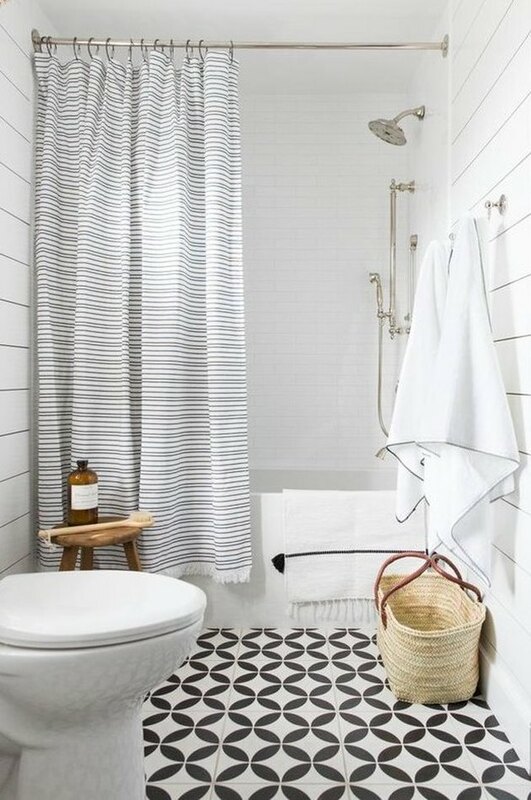 And did you notice how Shea from Studio McGee used the striped shower curtain to play off the linear quality of the shiplap walls? A pop of color, like black wall mount fixtures, can go a long way in a monochrome bathroom. In this spa-like sanctuary, designed by the team over at The Stables, the soothing light wood of a floating vanity reinforces the serene vibe. 7. Mix and match tiles. The last thing you want is for your design to fall flat. Create a multidimensional wow factor with a mix of tiles. 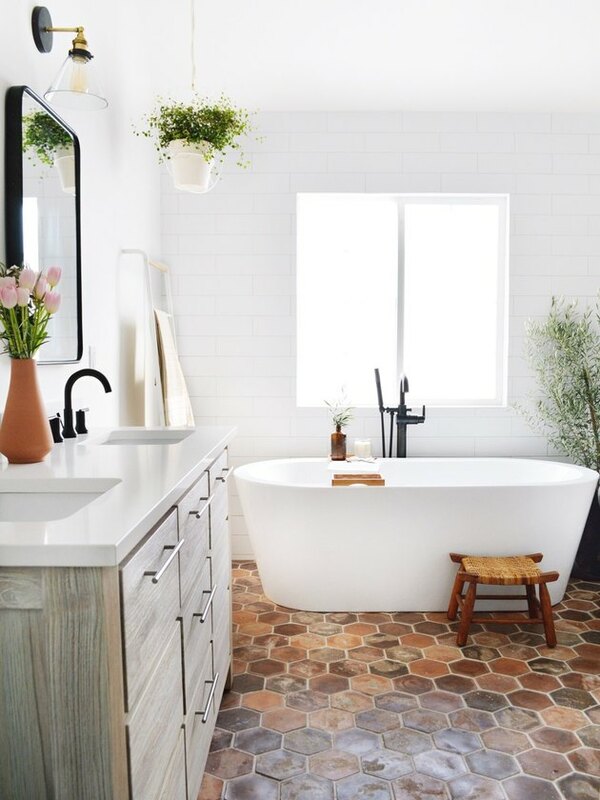 In this white bathroom idea, subway and hexagonal tile are an absolutely dazzling duo. 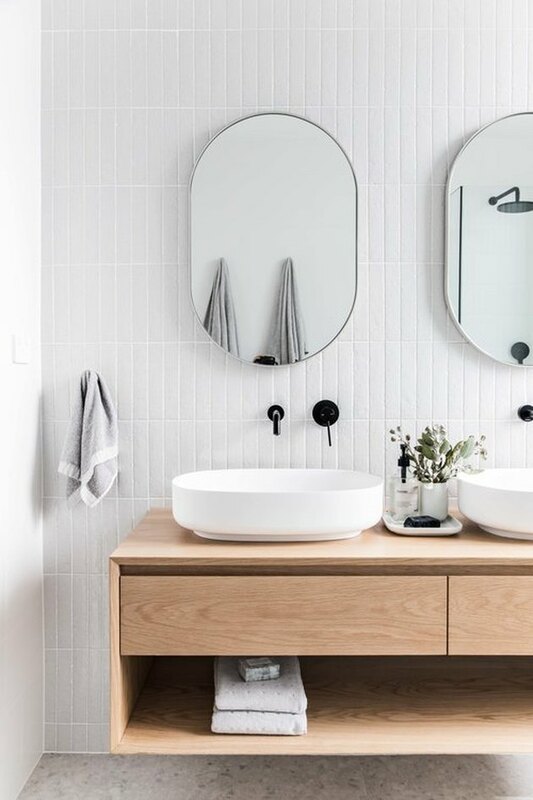 Clean and minimal but far from austere, this bathroom belonging to interior designer Kristin Dion highlights an array of warm textures. From the hexagonal brick flooring, to the shiplap walls, distressed wood vanity, and lush foliage, this white bathroom idea is far from boring. 9. Switch out the hardware and fixtures. Kick drab to the curb. For a rental-friendly update, swap out your existing hardware for something slightly more interesting. 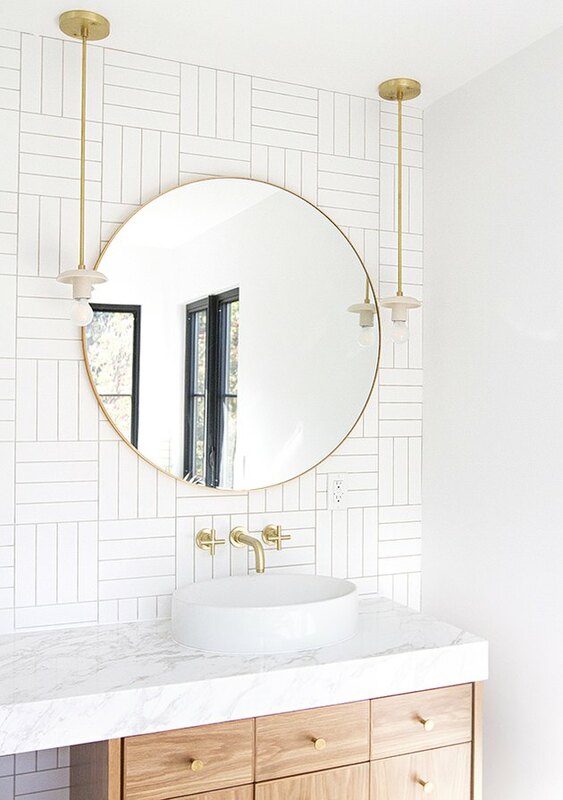 Sarah Sherman Samuel gave this bathroom a dazzling upgrade with brass hardware and fixtures. 10. Opt for patterned flooring. 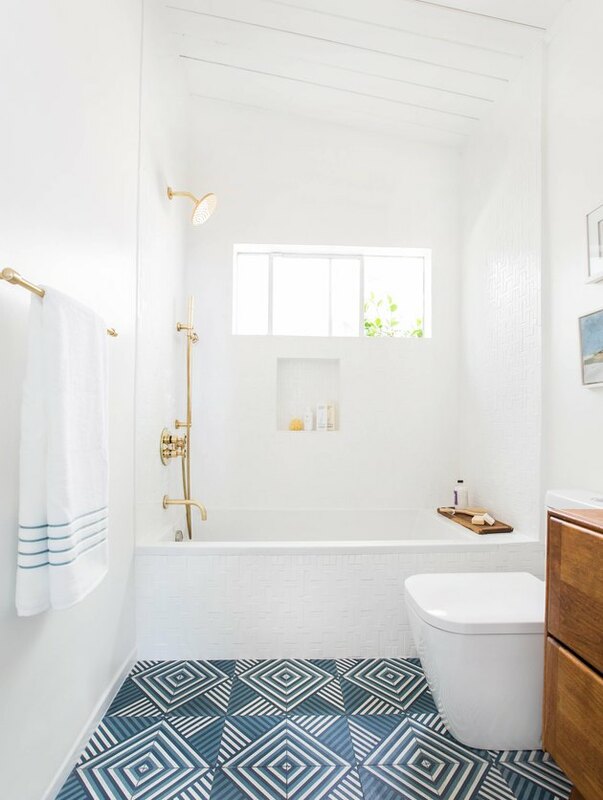 Take a cue from Emily Henderson and add a dynamic pop of color by installing patterned floor tile. We're loving the way it offsets the crisp white, well, everything. The edited approach to decor and materials is also worth noting. In this 1920s-era pool house bathroom the architecture is the star of the show. 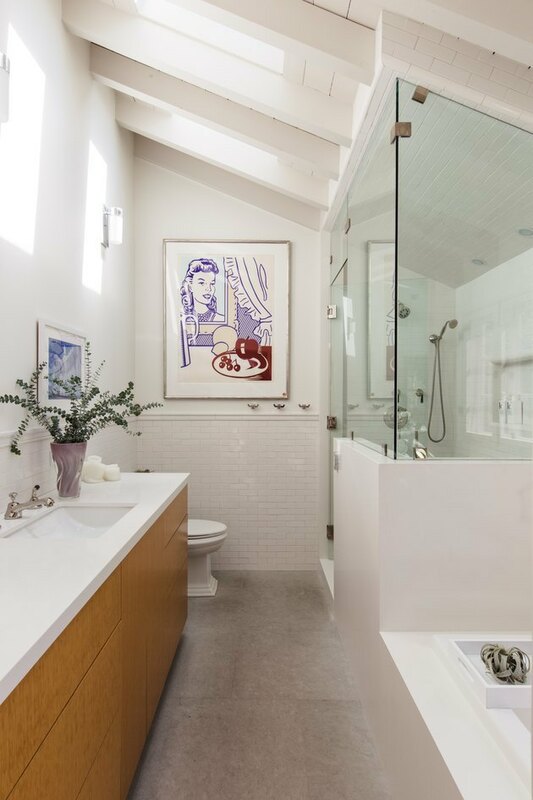 The sloped ceiling with exposed beams and skylights add intriguing angles while the retro artwork adds charming personality. The luxurious steam shower doesn't hurt either. 12. Invest in eye-catching artwork. 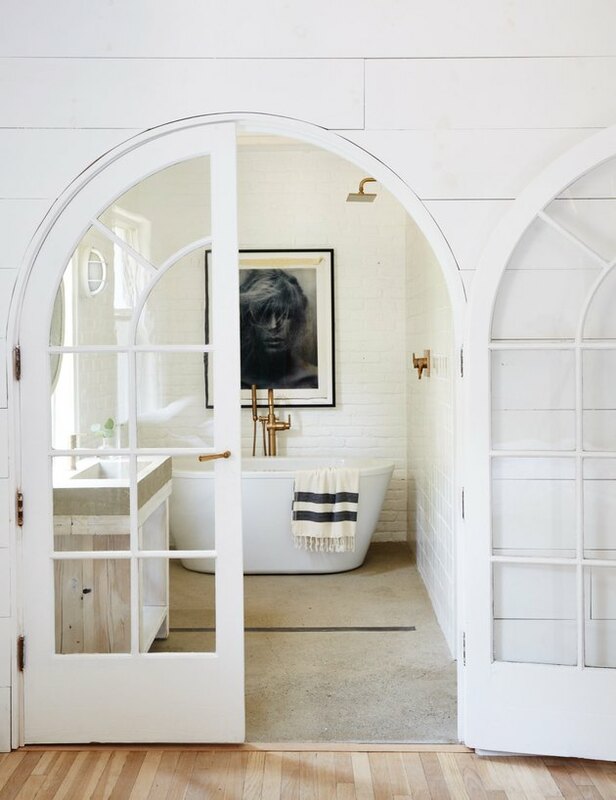 We're pretty much obsessed with this white farmhouse bathroom with concrete floors designed by Leanne Ford. The striking black and white artwork creates a beautiful backdrop for the modern bathtub-shower combo. And can we talk about those arched French doors? Swoon.